This article was just published in the Slave River Journal, reporting on Mervin and Chuck's presentation about the Inuvialuit Living History Project in Fort Smith, NWT. 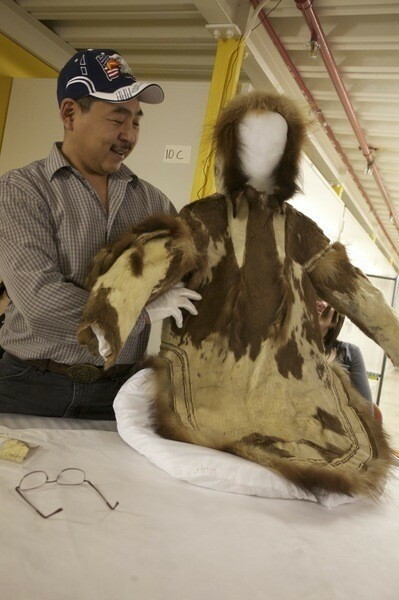 In the mid-1860s, Hudson's Bay Company trader Roderick MacFarlane sent thousands of cultural and scientific artifacts from the Fort Anderson trading post on Inuvialuit territory down to the Smithsonian Museum in Washington, DC. A century and a half later, a delegation of Inuvialuit elders, youth and educators traveled to the Smithsonian to catch a first glimpse of unknown and forgotten cultural artifacts held inaccessible to them for generations. Capturing their week-long visit to the museum's collection through thousands of photos, video, drawings and diagrams, the delegation is now sharing their findings with the rest of their people and the world. Last Monday evening, residents of Fort Smith got a unique glimpse into the history of the Inuvialuit with a guest lecture from two members of the delegation. Mervin Joe, an Inuvialuit Parks Canada employee, along with Charles Arnold, former curator for the Prince of Wales Northern Heritage Centre in Yellowknife, presented the story of the artifacts in a presentation called "Inuvialuit at the Smithsonian, Connecting the Present and the Past." The presentation featured dozens of photos of artifacts with stories attached, fueled by research done with elders and through historical documents. "We were just blown away by all the artifacts brought there," said Joe. "There were lots of items we couldn't identify, so we brought elders. They would be talking in their language saying they had seen them before and they would translate to the youth what they were." Evidence of reindeer hides, curved pipes and iron tools showed that Inuvialuit were participating in trade routes with Siberia for centuries before Europeans arrived. 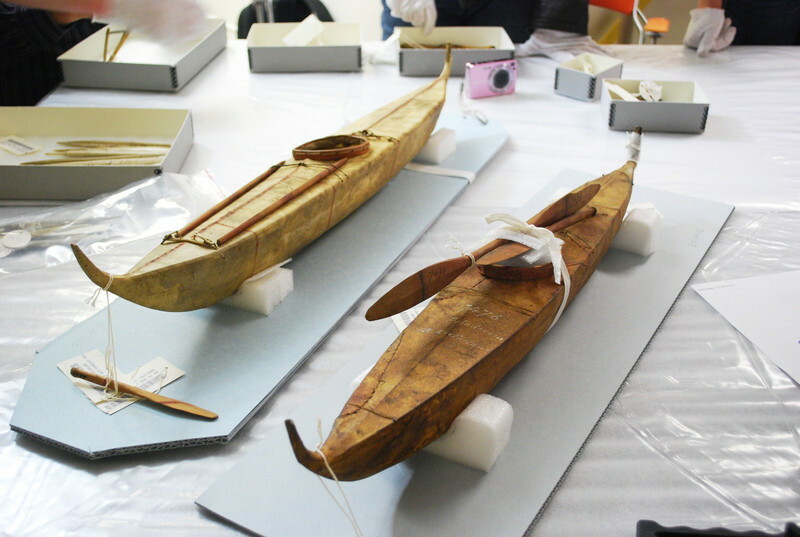 Other artifacts showed drawings on little wooden boxes depicting Inuvialuit activities and scenes, such as winter camps and people fishing. The pictures also showed artifacts absent from the museum collection, such as kayaks, which would have been too large to transport. Elders in the delegation made sewing patterns from the parkas, boots, pants and mitts on display at the Smithsonian, taking photos of the intricate detail so that they could be replicated. "We're taking the photos and videos to elders and to schools to teach about our ancestry," said Joe, noting that lesson plans have been developed to incorporate the findings into the classroom. Others are using the traditional knowledge gained from the artifacts to remake historical pieces, such as hunting bows, in the old style, first making the traditional tools. The delegation is currently creating an online version of the collection, complete with video, elders' stories, photos and illustrations, that will be launched in the near future. A film of the project made by Inuvialuit youth filmmakers is set to air on APTN this month.